Carolyn Peck was born January 22, 1966 in Jefferson City,Tennessee and is former head coach in Women's basketball at Purdue Universityand the University of Florida. She is also the first head coach-general managerin the history of the WNBAs Orlando Miracle. Currently, she is a basketballanalyst for ESPN. As a senior in high school, Peck, a 6-4 center, was named Tennessees MissBasketball after averaging 35 points and 13.2 rebounds per game. She playedcollege basketball at Vanderbilt University from 1985 to 1988, averaging 10.6points and 5.8 rebounds per game. She also blocked 180 shots, to date aVanderbilt womens basketball career record. Peck graduated from Vanderbilt with a Bachelor of Artsdegree in communications in 1988. She passed up on an opportunity to playprofessionally in Spain to work as a marketing consultant at a Nashvilletelevision station, as well as sell pharmaceutical products for a Fortune 500company for two years. Peck returned to basketball in 1991, quitting her job toplay professionally in Italy for three weeks, then for Japans NippondensoCorporation for two years. During her second year in Japan, her team won theleague championship. During Pecks first season as head coach (199798), Purdue went 2310 with anElite Eight appearance. Things appeared to be looking up for the followingseason; the bulk of the team was returning. Meanwhile, in April 1998 the young WNBA announced that itwas expanding from ten teams to twelve, with one of the new franchises to bebased in Orlando, Florida. Pat Williams, senior executive vice president of theOrlando team-to-be, began his search to find a head coachgeneral manager. Theoriginal list of prospects had six candidates, including Summitt, Dukes GailGoestenkors and Floridas Carol Ross but not Peck. After all six candidatesturned down the offer, Williams then called Peck upon the recommendation ofboth Ross and Goestenkors. In June 1998 Peck accepted the job with a four-yearcontract. Despite accepting this new role, Peck was faced with adilemma: having to return to Purdue to tell her team that they would once againhave to play under a new coach. After she broke the news, some of her playersfelt betrayed and angry, some of them even telling her so personally. So afterstruggling with the idea of leaving Purdue after just one season as theircoach, Peck again called Williams, asking him if she could remain at Purdue forthe 199899 season and then go to Orlando for the start of the WNBA season. Hegranted her request. In July it was announced that Peck would be the first headcoach and general manager of the Orlando team (now named the Miracle), andcoach at Purdue for one last season. The friction between Peck and her players eased, after theteam took a preseason trip to Switzerland and France for exhibition games. Bythe start of the season, the team was together, and Peck would neither discussthe fact that she was leaving nor answer any questions about Orlando. Led by Katie Douglas, Stephanie White and Ukari Figgs, theBoilermakers posted a 281 record during the regular season, the lone losscoming by one point against Stanford. The team won the National Championship(the first in Purdue womens Basketball; men's only basketball title came in1932), winning all six of its games by at least 10 points, including a 6245victory over Duke in the title game. Peck was named Womens Basketball Coach ofthe Year by the Associated Press, as well as becoming the first woman and thefirst African American to win the Winged Foot Award (which honored the bestcoach in college basketball) from the New York Athletic Club. Two weeks afterguiding Purdue to the title, Peck was in Orlando preparing the Miracle fortheir upcoming season. To date, Peck is the only African-American to coach awomens Division I basketball National Championship team. The title is also theonly one in womens college basketball by a member of the Big Ten Conference. On April 3, 2002, Peck returned to coaching college basketball, this time atthe University of Florida. On November 15 of that year, she was requested bylegendary comedian Bill Cosby that she introduce him as the headline performerat that years Gator Growl, the countrys largest student-run pep rally, whichtook place at Ben Hill Griffin Stadium. 58,403 people were in attendance aspart of University of Florida homecoming activities. NBA celebrities such as a Carolyn Peck have taken the game to new levels. The booking agents at AthletePromotions can assist with Carolyn Peck speaking engagements or appearances from the NBAs elite. We have years of experience in booking legends on the court for keynote speeches and autograph signings. 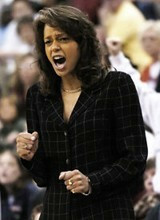 Hiring a basketball speaker like Carolyn Peck is not a hard process. Our agents can provide availability, fees and all costs associated in bringing out a successful football star to your next corporate event. We can find Carolyn Pecks agent to make your event a success.A Carolyn Peck appearance will add much excitement to your upcoming event.Most likely, basketball fans and corporations can find Carolyn Peck's official website, charity involvement, Twitter account, representation, publicist and management info at www.Carolyn Peck.com.